Grilled Pork Chops made on the Kamado Grill. They were marinated in a savory marinade of basil, garlic, olive oil and lemon. I grilled some pork chops today on my Kamado, like everything else I have tried since I bought it they were so delicious. I think the hardwood charcoal is one of the keys to the incredible flavor you get with this grill. It didn’t hurt either that I marinated the pork chops for about 30 minutes before grilling them in basil, garlic, olive oil and lemon. So good! I used frozen basil cubes I had in the freezer. I love the convenience of the cubes in case fresh isn’t readily available. If you are using fresh I would use about a half cup of basil leaves processed in the food processor with the rest of the ingredients for the marinade. I am so in love with this grill. I don’t think you can cook a bad meal on it. The food has that old I cooked it on the grill taste you don’t get with a gas grill. Don’t get me wrong, I love the convenience of a gas grill but it is so hard to get that grilled out flavor. I have in the past used a metal smoker box in box and added hardwood wood chips to it that worked pretty good but in the long run it damages the protective covers on the gas grill over the flames. I served them with some gorgeous grilled vegetables I got the other day at the Farmer’s Market. I cooked them on this fabulous grill pan I got from Wilton Armetale to try out. The vegetables are so easy to do. Blanch you vegetables for a couple of minutes, these include carrots, cauliflower, broccoli. Drain them and pat dry with a paper towel. Vegetables like zucchini, peppers and tomatoes will cook just fine without being blanched. Add all of the vegetables you want to roast to the strainer. Add a few tablespoons of olive oil, salt, pepper, crushed garlic and any other spice that will go with what you are cooking. 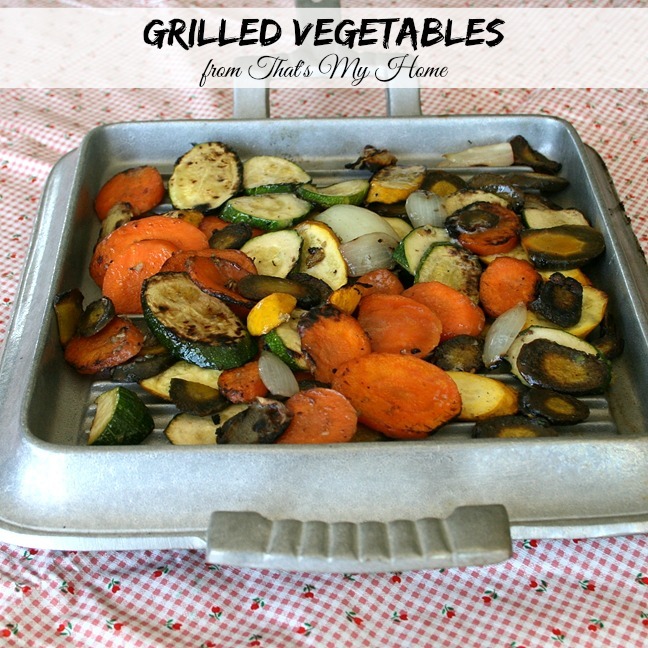 Put the vegetables on the grill pan or in a grill basket. Cook until the vegetables are started to brown and are tender. Mine took about 10 minutes. The blanching will give the harder vegetables the same cooking time as the softer vegetables. 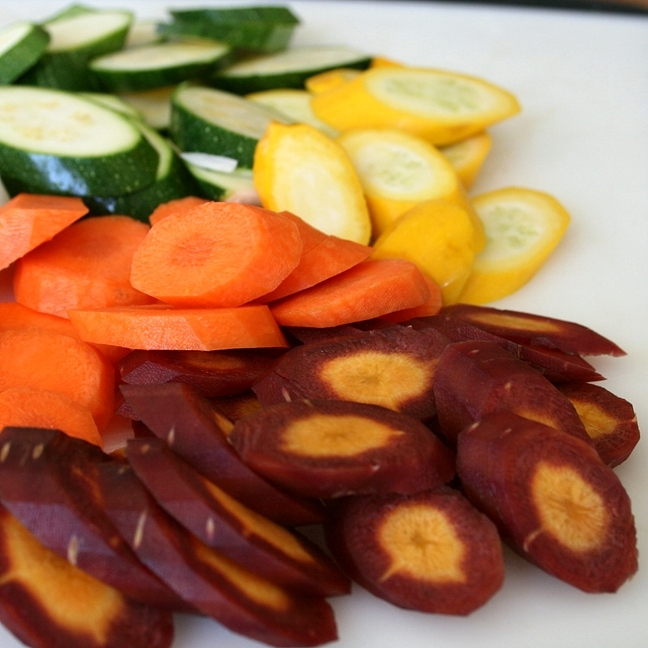 It also keeps the vegetables like the carrots a better texture when cooked that is not dry. I did some purple carrots here and didn’t like the color they were when grilled so won’t be doing them again. I will use them in salads and vegetable trays because they are prettier there. To blanch the vegetables, add the vegetables to boiling water on high heat. When the water comes back to a boil, drain the vegetables immediately. Run cold water over them to stop the cooking. Combine the basil, garlic, olive oil, lemon zest and juice in a small bowl. Brush it on both sides of the pork chops. Salt and pepper pork chops. Marinate at room temperature 30 minutes. Start a fire in the grill and get the grill to about 350 degrees. 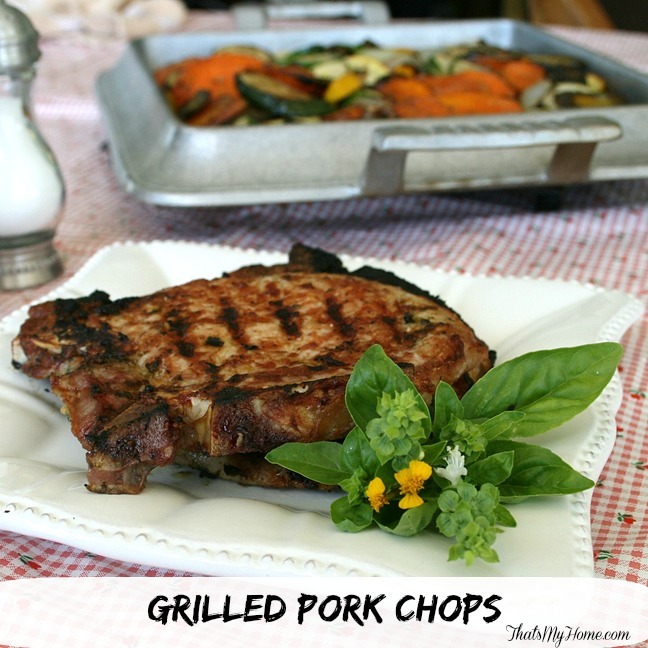 Place pork chops on grill and turn in about 7 minutes. I closed the lid on the Kamado grill. Check at 5 minutes to see if they are done. Do not overcook. The veggies were raw in the one pic, I just thought they were so pretty. When the purple carrots cooked they weren’t nearly as pretty. 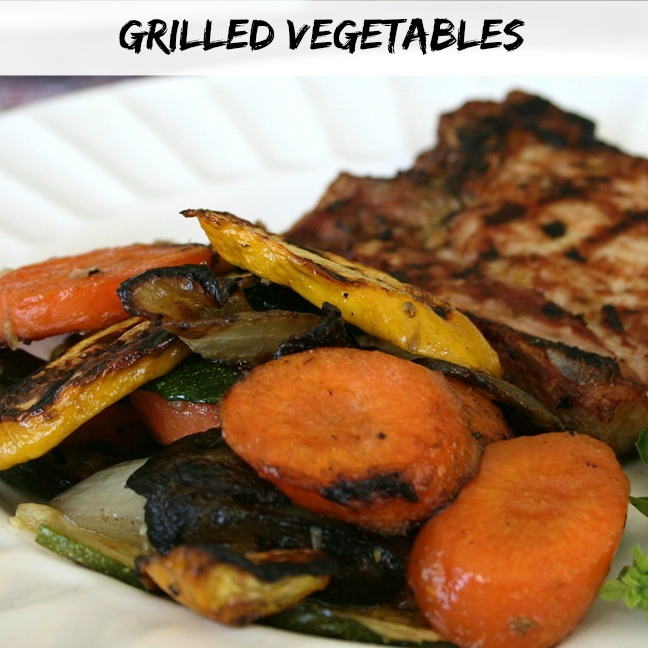 Love the grilled porkchops and really love the grilled veggies. That pan is awesome – I have it also!